Value Investing » Markets and Economics » How to Invest After BREXIT? Britain’s decision to exit the European Union has profound implications for the global economic structure. But how does this impact you as an investor? Let’s take a look at how the global business may be affected and how you may want to reposition your investments to take advantage of the changes or at the very least protect the investments you have today. We have had decades of globalization characterized by opening up of national borders, free trade agreements, and in some cases monetary union. The easing of the barriers to capital flows and people movement allows the resources to move where they are more needed and helps improve the economic well being of citizens by providing them more and better opportunities. Globalization is rooted in the Ricardian Theory of Comparative Advantage, which states that countries specialize in producing goods and services that they are more efficient in, so they can trade with other countries that produce other goods and services. The Theory of Comparative Advantage works when the markets are undistorted. When the economic landscape is broken into many smaller pieces, each with its own trade barriers and economic paradigms, each piece or country produces inefficiently. Higher costs of production lead to higher cost of living and decreased prosperity. The British vote is hardly an anomaly. Populism is on the rise and there are many groups and parties in countries like Spain, Italy, France, Netherlands and Greece that are opposed to EU and the requirements to remain in good standing in the community. On the flip side, citizens of Germany that has been doing the bulk of heavy lifting in EU do not like subsidizing other economies. The union is not based upon a shared belief and it will not surprise anyone if other countries decide to hold their own referendum and choose to exit the EU. EU may not survive if drastic changes are not made to make staying within the union more attractive than leaving it. If this happens, European assets and equities will suffer as doing business in EU becomes harder and more expensive. Financials are definitely the sector that you should avoid for now. Specifically European banks, but any bank that has a large exposure to Europe is a risk. Similarly, I would avoid insurers that are exposed to British and European assets. Finally, I will be wary of the multinationals that derive a large amount of revenues from UK. Banks like Barclays, HSBC, etc have already been beaten down on Friday after the BREXIT vote. I expect further losses in these names as the BREXIT story plays out over the next months and years. I believe the impact on these companies will be secular and they will try to mitigate the risks by relocating to the continent or even outside EU. If that happens, we will reconsider the thesis. We have a couple of companies in the VSG portfolio that are in many ways based out of UK and are also traded on the London Stock Exchange. However, these companies have minimal exposure to UK in terms of operations and revenues, and while they have been affected by the indiscriminate selling after the BREXIT vote, their stock should do well from here and this is a great time for new investors to initiate positions in these stocks (they also trade in the US). The Stratfor Analysis on the global impact of BREXIT is worth a read (free subscription required). It paints a grim picture of Europe, speculates that the oil recovery will be delayed, and postulates that Russia will be the biggest winner out of this whole debacle. There will be many global trade shifts as countries rework their trade agreements and supply chains to adjust to the new reality. While it is hard to avoid Europe altogether, as most large companies are exposed to the continent one way or other, it is possible to keep this exposure to the minimum by focusing on companies and businesses with mostly domestic markets. North America, Asia and Australia will deliver growth and well functioning markets with the benefit of not being part of EU. Other free trade blocs similar to EU such as ASEAN and GCC may slow down their integration efforts. Japan may have trouble re-inflating their economy. China and India may need some changes but will come out relatively unscathed. US economy is robust (in comparison) and will do well, while Canada and Australia are economies dependent on commodity cycle so if Europe falls into recession, they will see some impact, but this can be offset by growth in China and US if this were to happen. Small companies tend to be single country entities. If we focus on US based small companies, these stocks are less likely to be impacted by any political and economic blowback from BREXIT and other potential changes in the EU. Larger multinationals are more exposed to the political and (EU) recession risk. Since 2008, value stocks have lagged the growth and momentum stocks. For most periods of 10 years or more, value stocks out perform growth and small caps out perform large and mid cap stocks. Small cap value stocks have consistently been the most profitable asset class. This is a well observed phenomena and is supported by the existence of the value premium and the size premium. With the long deviation from the norm, we now have a situation where the larger company stocks are over valued and more susceptible to geo-political and macro-economic risks. Smaller company stocks are cheaper and these businesses will prosper even if there are significant political and macro-economic changes. Beginning 2016, we have already seen the capital flow into small and value stocks after many years of investors chasing momentum and we believe this is going to continue for the foreseeable future. We are almost to the close of the first half of 2016. This year has been volatile but a consistent and disciplined approach to investing has seen us compile an year to date return of 1.35%. 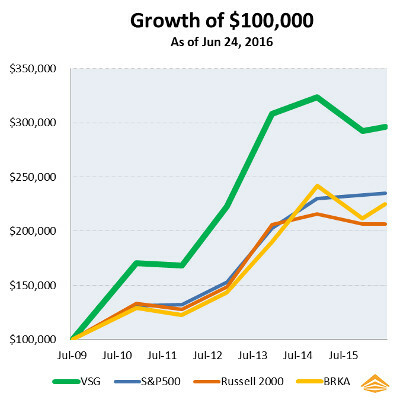 This compares favorably with S&P 500 (0.76%) and Russell 2000 (-0.02%). All returns are total returns including a reinvestment of dividends. In fact, since 2009 when we started tracking the Value Stock Guide portfolio, we have SIGNIFICANTLY out performed S&P 500 and Russell 2000 indices. We have also soundly out performed Berkshire Hathaway stock (BRKA).